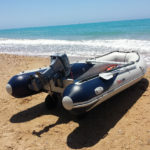 These small dinghies are excellent teaching boats a fantastic choice to progress your sailing or just go for a blast. A simple clear cockpit area with a high boom height means they a great for children and adults alike. 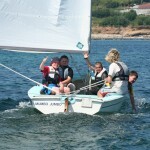 They also have a good-sized jib, making Topaz good to sail with a partner as well as single-handed. We also have a couple of Race XL versions, which are fitted with an asymmetrical spinnaker to give you an extra turbo boost.